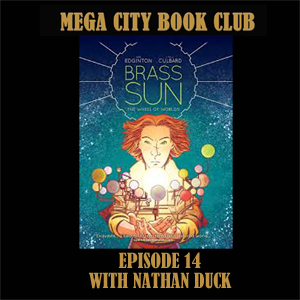 Nathan Duck joins me in a clockpunk version of the book club to discuss the gorgeous, glossy hardback edition of Brass Sun by Ian Edginton and INJ Culbard. We wax lyrical about the story, characters and artwork, and we keep the spoilers to a bare, cog driven minimum. Get your copy of Brass Sun from the 2000AD online store, or dip your toe in with the free digital version of the first US issue.